Below are some links that I have found useful for insect and host plant identification and nomenclature, along with conservation organizations that work in my beloved state of Missouri. Website by world buprestid expert Charles L. Bellamy of the California Department of Food and Agriculture, author of An Inordinate Fondness for Beetles and the newly published World Catalogue and Bibliography of the Jewel Beetles (Coleoptera: Buprestoidea). This website is a wealth of resources for all things buprestid, including links to the complete bibliography and species name index used for The Catalogue, links to lists and photos of types, online literature resources, an archive of the BUPRESTIS newsletter (both older PDFs and more recent electronic issues), plus photos and contact links to virtually every buprestid worker (“extant” and “extinct”). A website by Maurizio Gigli of Italy, who describes it as “An Entomological Page focused on Jewel Beetles (Coleoptera Buprestidae), specifically dedicated to amateur entomologist, to make easier to exchange or buy specimens, data, etc.” The multitude of links includes literature and species in his collection, a checklist of Italian Buprestidae, a higher classification of the family, specimen exchange notices, host plants of western Palearctic species, collecting trip reports, and many excellent photographs of live adult buprestids in the field (mostly from Italy and North Africa). This site by Michal Hoskovec and Martin Rejzek was initiated in 1997 and has been regularly updated with a photo-gallery containing images of over 620 West Palaearctic species. Links to these photos are conveniently arranged in taxonomic lists arranged by subfamily and tribe and include author and date of each taxon. The full color photographs are of excellent quality, and often live individuals as well as museum specimens are shown. For most species, indications of size, duration of life cycle, temporal occurrence, host plant associations, and geographic distribution are included, and for selected species details on their biology and host plants are also presented. The site also includes reports of collecting expeditions. A very good site! This website, by Larry Bezark of the California Department of Food & Agriculture, contains photographs of nearly every species of Cerambycidae occurring in the North, Central, and South America. The photographs are organized in checklist format following the Checklist of the Cerambycidae of the Western Hemisphere that has been published since 1993, and which is now kept current in electronic format by the author of this website and Miguel Monné (the current version of which is available on the website). For many species in the catalog, images of the type specimen or type series are presented – a real benefit to researchers by reducing the need to borrow these important specimens for taxonomic studies. Mike Thomas and colleagues at the Florida State Collection of Arthropods have assembled this excellent website. General sections include an introduction, discussion of the Florida fauna, specimen preparation, and a bibliography. Treatments for the 234 species known from Florida can be accessed either by links in a checklist format or by scanning thumbnail photographs and include thumbnails to full-sized photographs, state distributional maps, and brief notes on size, overall distribution, and hosts. 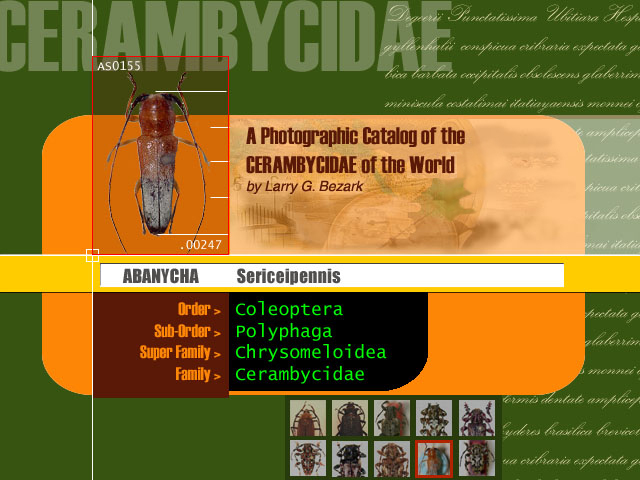 This comprehensive website by Eugenio Nearns, University of New Mexico, contains numerous links to cerambycid catalogs and checklists, regional treatments, type collections, organizations, contact links for cerambycid workers, and a gallery containing excellent photographs of live adults in the field of selected species from Florida, the West Indies, and South America. Tiger beetle website by Cesare Iacovone from Italy. Includes sections on biology and ecology, morphology and anatomy, distribution, Italian species, a species checklist, photo gallery, people, the author & his collection, literature, and announcements. Online publication by David Pearson, Timothy Barraclough, and Alfried Vogler presenting the known distribution of each of the 111 species of tiger beetles from North America on a state and province outline map of the United States, Canada and extreme northwestern Mexico. Online version of my article augmented by superb field photographs of live adults by colleague Christopher Brown, which appeared in the June 2001 issue of The Missouri Conservationist. Covers classification, life cycle, field identification, threats to tiger beetles, and conservation of the 21 species known (at the time) to occur in Missouri. Short collecting and habitat notes with lots of photos of live adults in the field by Giff Beaton covering the 25 species of tiger beetles known to occur in Georgia, along with a dozen or so additional species from other parts of the eastern U.S. The original Nebraska tiger beetle website. Created by Steve Spomer and colleagues at the University of Nebraska in Lincoln, it includes photographs (some of living specimens), state distributional maps, and short descriptions and notes on similar species, range, Nebraska distribution, habitat, seasonal occurrence, and status of 31 species of tiger beetles. A second Nebraska tiger beetle website created by Matt Brust and colleagues at the University of Nebraska in Kearney. This excellent website builds on the Spomer Tiger Beetles of Nebraska with more detailed treatments of 32 species of tiger beetles known to occur in Nebraska, including photographs (often multiple specimens to show variation), state distributional maps, appearance, comparisons, biology and life history notes for both adults and larvae, and biogeography. Also included are sections on tiger beetle identification, life history, and conservation. Differs from the Spomer website by its inclusion of Cicindela decemnotata but not C. tenuisignata, and by treating C. cinctipennis as a full species rather than subspecies of C. terricola. Website by Steve Marshall at the University of Guelph in Ontario, it includes an Overview and general sections on subfamilies, species in Ontario, identification, common names & synonyms, photographs, classification & higher taxa, geographic distribution, natural history, and how to encounter. Species treatments include field photographs of (mostly) live adults and detailed notes on identification, comparisons, habitats, and seasonal occurrence of 14 species of tiger beetles known to occur in Ontario. Website by Doug Backlund and colleagues, it includes photographs, state distributional maps, and comments on identification, habitats, and seasonal occurrence of 24 species of tiger beetles recorded from South Dakota. From the Zadock Thompson Natural History Collection in Burlington, includes photographs and short comments on habitats and distributions for 16 species of Vermont tiger beetles. Part of the Wisconsin Butterflies website by Mike Reese, 16 species of Wisconsin tiger beetles are illustrated with multiple, high-quality, field photographs of live adults. Includes state distributional maps and short notes on habitats and seasonal occurrence. An excellent resource coordinated by W. Wyatt Hoback and John Riggins of the Northern Prairie Wildlife Research Center, this website contains detailed nationwide distributional maps for all species of tiger beetles occurring in the United States. Contains an introduction, photo thumbnails, checklists of all species reported in a particular county or region, and distribution maps for individual and combined states that allow the user to navigate through species for identification. Species treatments include short summaries of identification, habitats, and seasonal occurrence. This web ring is for sites which are about the insect order Coleoptera (beetles). Your site can contain information about any kind of beetle from scarabaeids to cerambycids, but it needs to be a site with actual natural history information. Sites which advocate the conservation and captive breeding of beetles are especially welcome. Are you a beetle enthusiast and/or hobbyist with a site about beetles? If so, please come join us! Author Colin R. Owen calls this “The Website for the Beetle Collector.” It is a very nicely organized collection of photographs of not only beetles but other insect groups from southern Africa. Many (but not all) of the insects pictured are offered for sale, making this a semi-commercial website. However, the fair diversity of species presented across many groups makes this an informative site for those interested in African beetles. Created by Robert Perger, this still under construction website already contains hundreds of spectacular, high resolution images of tropical beetles belonging to the superfamilies Caraboidea, Cerambycoidea, Scarabaeoidea and Buprestoidea. In addition to the photographic catalogue, the site includes beautifully illustrated discussions of morphology, physiology, biogeography, evolution (with an exceptional animation of plate tectonics from 250 mya to present), and adaptation. The site also has a blog, although it does not appear to be actively updated. Nevertheless, the spectacular diversity of images in the above beetle taxa are enough to keep me checking back for any updates. A website by Udo Schmidt of Germany, containing hundreds of high quality images of beetles from around the world and belonging to many different families. There is a strong emphasis on species from the Palearctic Region, although significant material from other biogeographical realms is also presented. The limited text is in German, but no language is needed to enjoy the excellent photographs, each showing collection data. Butterflies and Moths of North America (BAMONA) is a searchable database of verified butterfly and moth records in the United States and Mexico. The site includes dynamic distribution maps, photographs, species accounts, and species checklists for each county in the U.S. and each state in Mexico. Nearly 4,000 species are covered, represented by more than 40,000 records and over 1,000 high-quality photographs. BAMONA data are updated regularly and come from a variety of sources, including citizen scientists. The premier website for “Identification, Images, & Information For Insects, Spiders & Their Kin For the United States & Canada.” Hosted by Iowa State University Entomology, BugGuide is an online community of contributors and specialists who have built the largest collection insect photographs available online. A consortium of editors has built the structure and is continually improving it. Features a clickable guide to facilitate insect identification, an ID request section, and a forum, with comprehensive information on taxonomy and classification throughout. “Equipment, Supplies and Books For Entomology and Related Sciences.” Since college, I have looked forward to each new BioQuip catalogue like a 12-year old boy looks forward to his mom’s Victoria’s Secrets catalogue. BioQuip has become the entomological supply house as a result of their comprehensive offerings and continuous product refinements. If you can’t find something you need at BioQuip, it doesn’t exist – but chances are they will invent it soon. Their offerings also include botany supplies for the many entomologists out there whose studies involve collection and preservation of host plant vouchers, allowing for true “one-stop” shopping. Biodiversity Explorer, created by the Iziko Museums of Cape Town, is devoted to showing and explaining the diversity, biology and interactions of life in southern Africa. For insects, stunning photographs from Field Guide to Insects of South Africa are provided that illustrate representative species within different subfamilies and tribes. The photographs alone make this website a must for anyone interested in biodiversity, let alone those with a particular interest in Southern Africa. In fact, as soon as I finish writing this web page, I’m going to order a copy of the field guide for myself! Calflora provides information on wild California plants for conservation, education, and appreciation. Plant species can be searched by name, place or plant community, with species treatments including nomenclature, synonymy, communities, and state distributional maps for over 9,000 native and introduced species in California. A website by Dr. John Hilty that contains descriptions, photographs, and state distributional maps of many of the wildflowers found in Illinois. Species treatments contain detailed summaries of description, cultivation, habitat, faunal associations, and general comments about the species. An excellent website by Mike Haddock, who states “This site contains information and more than 2860 identification photos for some 573 species of forbs, grasses, sedges, rushes, and woody plants that are found growing in Kansas.” Species treatments contain quality photographs and detailed summaries for identification, with comments on state distribution, habitat, forage value and uses. Website by the late Dan Tenaglia contains photographs and descriptions of more than 1000 flowering and non-flowering plants in Missouri. Species treatments can be accessed by flower categories or an all-species list and contain multiple superb photographs of each species with detailed descriptions and comments on flowering, habitats, origin, distribution within the state, and similar species.Dan Tenaglia died tragically in February 2007 after being struck by a car while riding his bicycle. Dan’s wife has kept this site up and running in honor of his passion for plants, but doing so requires effort and support. If you value this site and wish to help support its maintenance, you can make a donation to the “Dan Tenaglia Foundation”: 1416 Victoria Avenue, Opelika, Alabama 36801. Thumbnail photographs arranged in flower categories or an all-species list lead to species treatments, which contain photographs and brief notes on bloom time, habit, height, longevity, flower shape, and for some species additional comments. Includes a very extensive links list to other wildflower image websites arranged by state. TROPICOS is a plant specimen and nomenclatural database developed by the Missouri Botanical Garden, containing all of the nomenclatural, bibliographic, and specimen data accumulated in The Garden’s electronic databases during the past 25 years. This system has over one million scientific names, 3.4 million specimen records, 111,000 bibliographic citations, and more than 70,000 images of living plants and specimens. Flexible searching capabilities. The Ozark Trail is a part of a vision, conceived in 1977, to build a scenic and varied route through the Missouri Ozarks, stretching from the St. Louis metropolitan area southwestward to the Arkansas border, eventually connecting to the Ozark Highlands trail– creating a 700 mile through-trail. Almost 550 miles of trail have been completed, with 350 miles in Missouri.” My friend Rich and I have hiked ~250 of these miles. Shaw Nature Reserve, an extension of the Missouri Botanical Garden, includes 2,500 acres of natural Ozark landscape and managed plant collections. Located 35 miles southwest of St. Louis in Gray Summit, Missouri, it provides environmental education, ecological research and public enjoyment of the natural world.” Glade and prairie restoration projects capably managed by my colleague and friend, myrmecologist Dr. James Trager. The mission of The Nature Conservancy is to preserve the plants, animals and natural communities that represent the diversity of life on Earth by protecting the lands and waters they need to survive.” A simple, elegant, effective approach!